Be treated to quality without a trace of ego – genuine goodness with special touches infused into delicious dishes and heart-warming service. The Harajuku and Jingumae area of Tokyo are more likely to evoke images of the crowded Takeshita-dori shopping street, funky clothing stores, and eclectic youth. 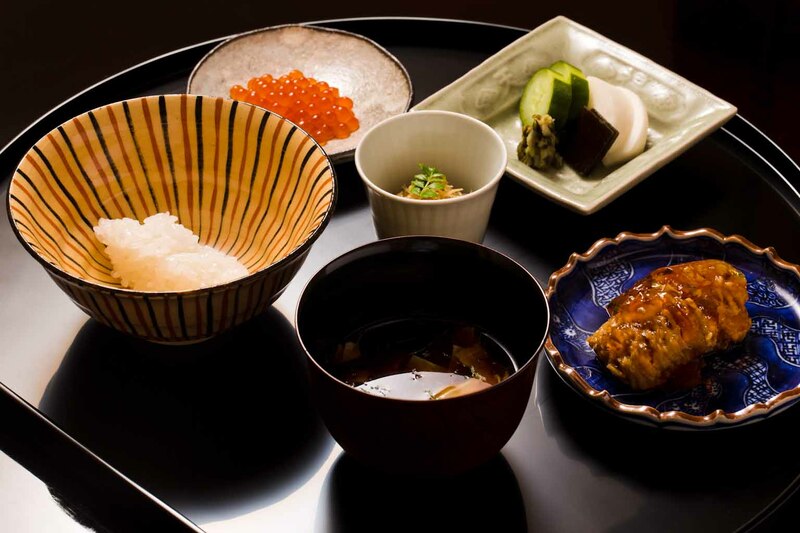 But meander away from the station a little further and you will find classic, clean, delectable Japanese cuisine in this warm and welcoming eatery called Higuchi. A dark wooden wall, the pebble stone staircase, and the trickle from the little garden water feature encourage you to take a relaxing breath as you settle in to your evening. The entranceway sets the stage with seasonal motifs that will emerge throughout your meal: autumn months mean freshly harvested sheaths of rice and a silver and gold lacquerware hanging reminiscent of the harvest moon. Apart from these few adornments, the setting is minimalist and calming. Having just reopened in October 2016, newcomers and regulars alike are intrigued by the new interior, enamored by the craftsmanship. Peeking into the private room and taking in the fresh wood aromas – it is not just the chef who is happy with this reinvented space. 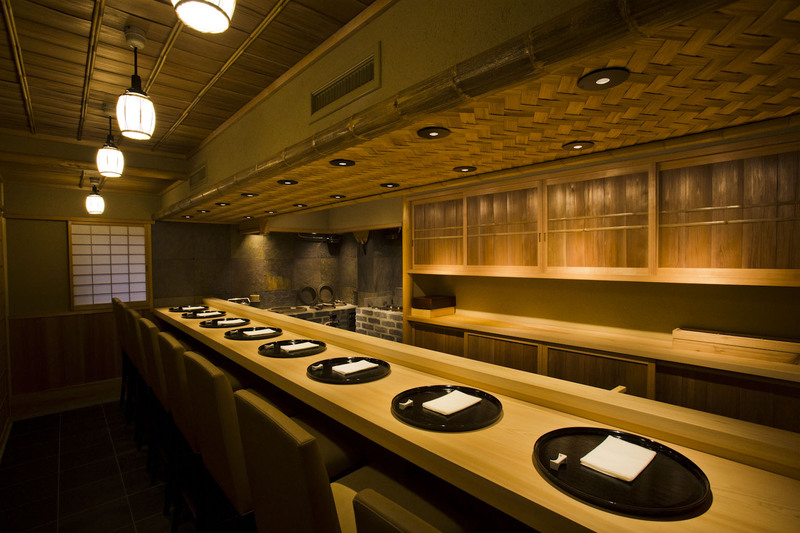 The counter kitchen, where the chef loves to engage in conversation with his customers sitting on soft caramel-colored seats, features various timbers like zelkova and the richly aromatic Japanese cypress. You will also find bamboo – thick, thin, round, square, and even some with a pattern that resembles the small black sesame seeds sprinkled as seasoning on rice. The counter, cupboards, and ceiling all exhibit detailed woodwork, sometimes complementing and sometimes contrasting in color and direction. The chef’s gas and charcoal workspace is surrounded by beautiful slate rock from India, the slices of which reveal different colors and patterns, and possibly even fossils. 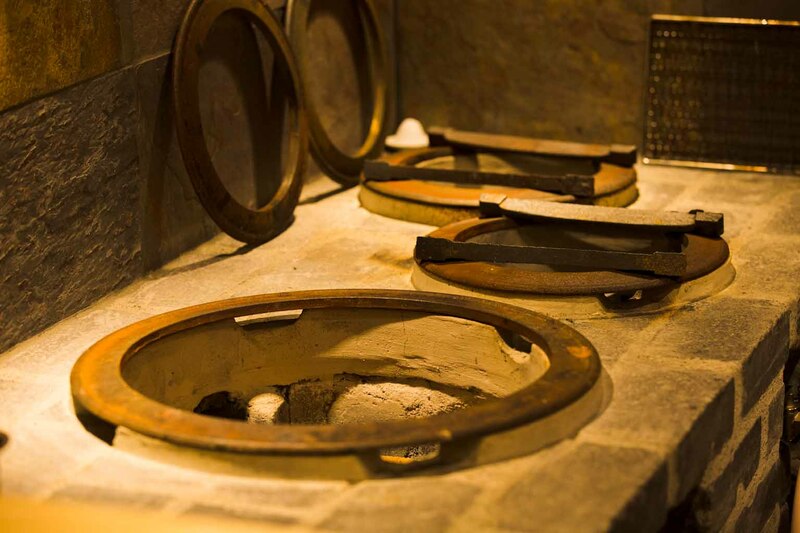 Enjoy true Craftmanship at Higuchi. The seasons and the bounties they offer drive the cuisine here. 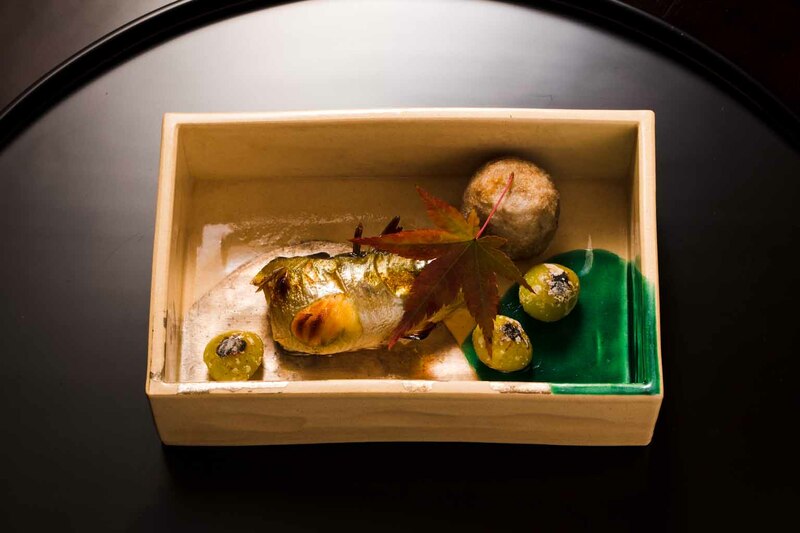 Chef Higuchi serves up a course filled with seasonal delicacies presented in approachable, appealing and palate-pleasing ways. 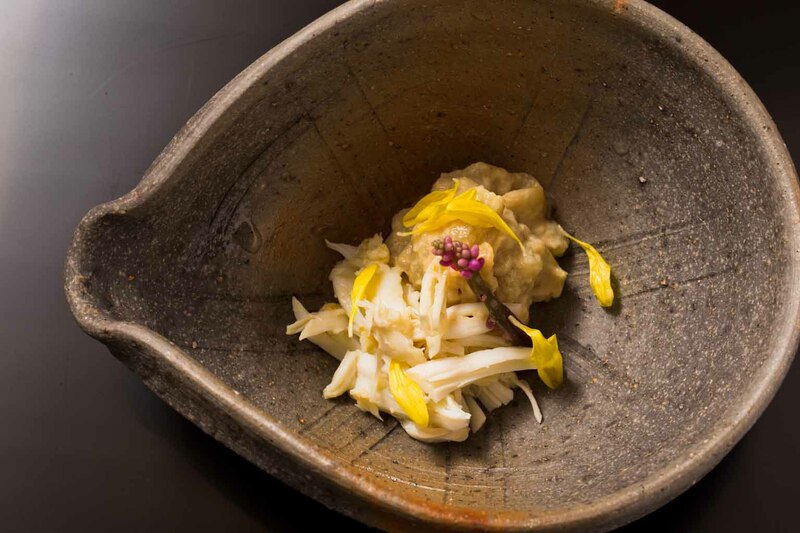 He enjoys reconstructing and modernizing traditional Japanese dishes, and often finds inspiration when eating new ingredients at restaurants of other cuisines. 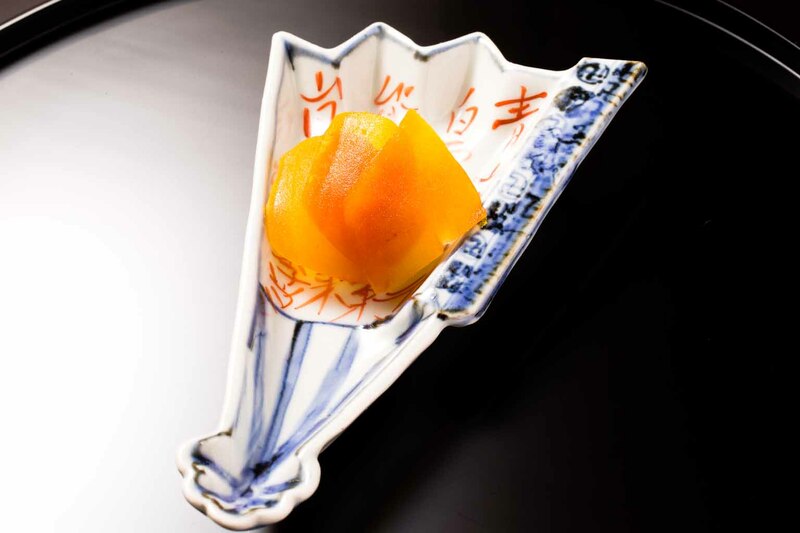 A fan-shaped dish delivers almost translucent dried mullet roe slices atop sticky rice for a salty, umami-rich start. This may be followed by sesame-dressed grilled eggplant with crab, and slightly charred sashimi of longtooth grouper with fantastic full texture. 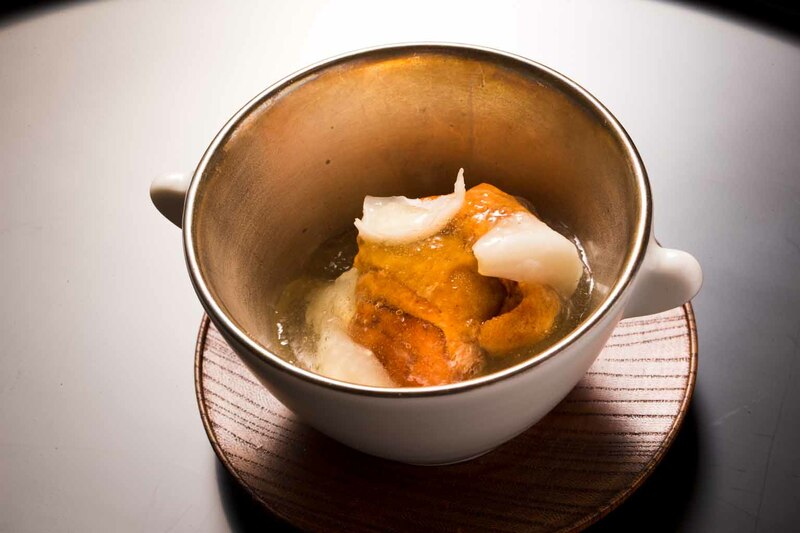 A richer warm dish with grilled fish and gingko nuts precedes a cooler, refreshing one like sea urchin and lily bulbs in a bonito dashi gelée. 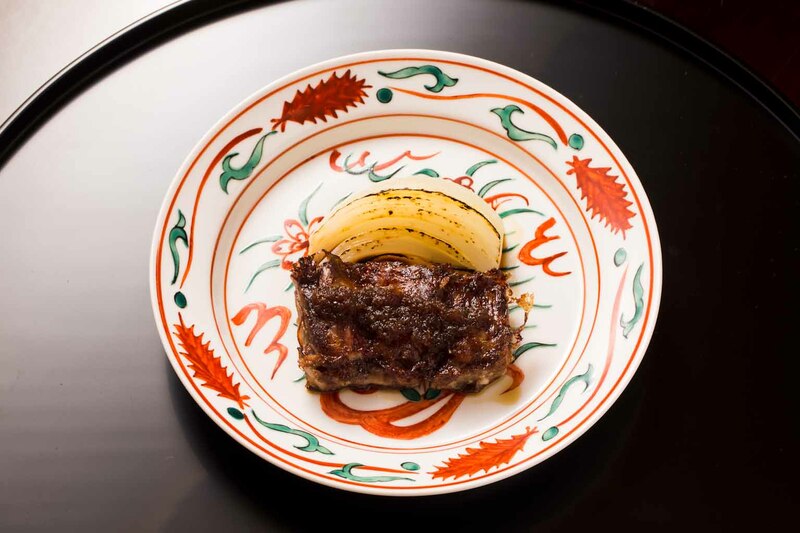 Then a piece of oxtail simmered to mouthwatering softness topped with ever-so-sweet onion jam. And so on, until you reach the final course, which in a typical Japanese meal is either rice or noodles. Here you can have both: handmade soba and springy white rice with lots of tasty accompaniments. Delicate flavor, temperature and texture combinations greet you in a bountiful course of dishes, but surprisingly you are left feeling light. This is a testament to Higuchi’s quality and adherence to the traditional cooking style for which Japan is now so well-known. It also means you still have space for the delicious hand-crafted desserts. And if you would like to enjoy a drink with your meal, choose from a wide selection of wine, sake, whiskey, and shochu Japanese spirits stored in the new floor-to-ceiling cellar. It is filled with libations all personally tasted and selected by Higuchi’s wife and restaurant partner. 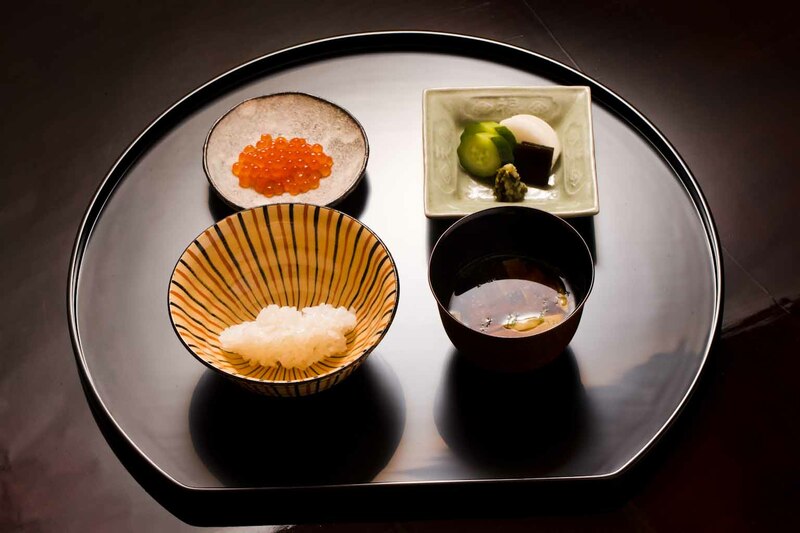 Higuchi procures his ingredients through daily morning visits to Tsukiji, maintaining importance face-to-face relationships to secure the ideal produce. He also uses a text messaging system with contacts in Kyoto: sometimes he places specific orders and knows what is coming; other times he is pleasantly surprised as he opens boxes of fish or vegetables that have just arrived on the latest flight. One essential ingredient is buckwheat, the base for the soba noodles the chef personally makes every day. After all the preparation is done and the staff meal is complete, Higuchi settles in to knead and roll the dough before cutting the delicious strands of fresh noodles for guests who will start arriving shortly. 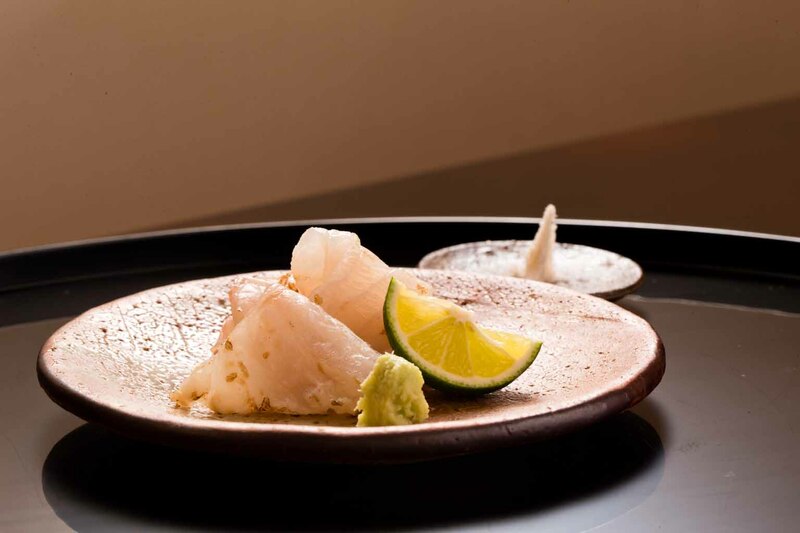 Born and raised in Shibuya, Kazuhito Higuchi comes from a family of restaurateurs. From an early age, he helped out at the six-seat kappo style eatery in Shibuya run by his parents. After high school, he joined the kitchen of a Japanese restaurant in Akasaka frequented by politicians and other elites. The sudden death of his father when Higuchi was just 24 years old presented him with the chance to take over the family business. But he didn’t want that. He wanted some more time to do his own thing, at his own pace. Instead his younger brother decided to turn the space into a yakiniku (Japanese charcoal barbecue) restaurant and has gone on to much acclaim as the owner chef of the hugely popular Yakiniku Yuji. Higuchi toiled away, constantly aware of his role having been founded on his father’s reputation. He couldn’t envisage his future where he was, so after eight years and with the support of his master, he left to experience other kitchens and build his skills. Jumping around between Tokyo and Kyoto, nowhere offered the ideal environment, but he always managed to see the positives in an experience: getting to relive his high school surfer days in the mornings before lunch service at a Kamakura restaurant, or building his knowledge and collection of beautiful tableware. 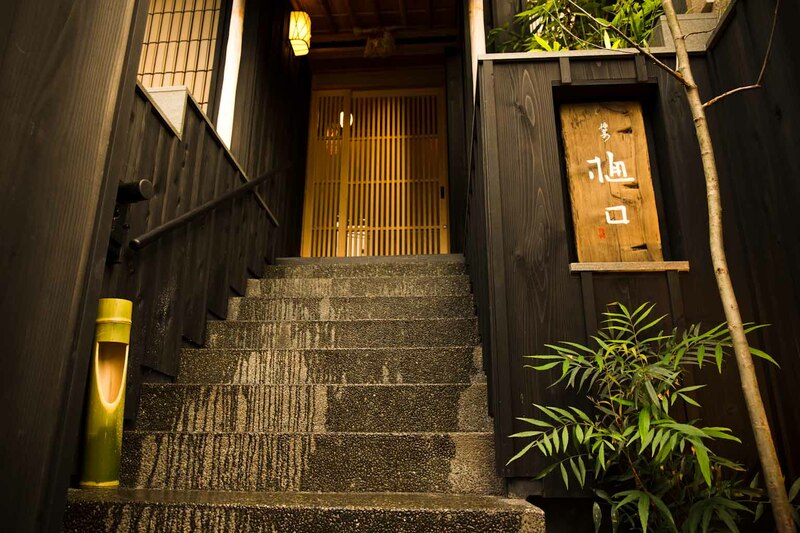 Then, in 2000, at the age of 34, Higuchi decided to go out on his own, having found the space at the location where his restaurant presently stands. It started as an endeavor of two – Higuchi and his wife – slowly expanding over the years to the team that runs it today with the same level of warmth and attentiveness as when they first began. Changing the interior three times in the ensuing years, he is now so deeply satisfied that he sometimes even comes in on his days off, standing in his kitchen, or admiring the glossy black table in the private room that he varnished himself. Higuchi is clearly so happy here. He is living his vision. And if someone is happy with their space and satisfied by what they do, that translates in the items they produce. All that passion, experience and satisfaction poured into his cooking – we are so lucky to be able to enjoy the delicious dishes of this master chef. 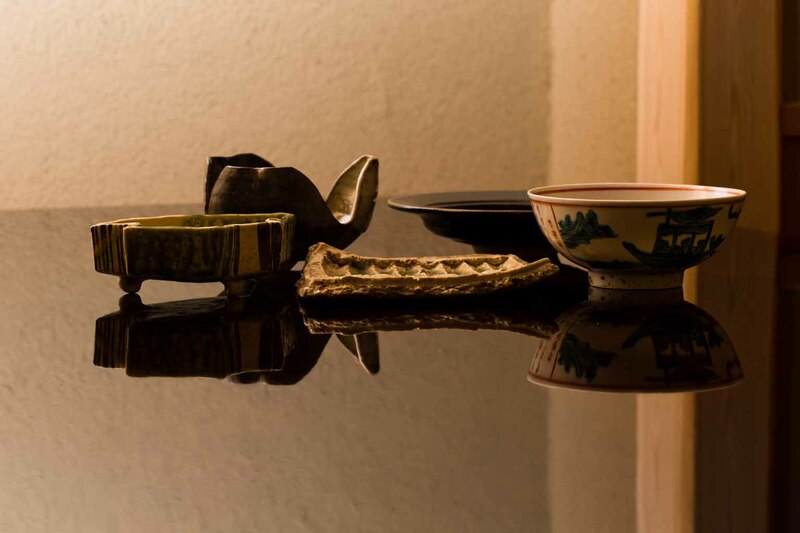 Higuchi has always been drawn to tableware that has an earthy quality and conveys a sense of strength. It doesn’t need to be a particular category or from a certain location; two preferred tableware dealers seem to know just what he likes. 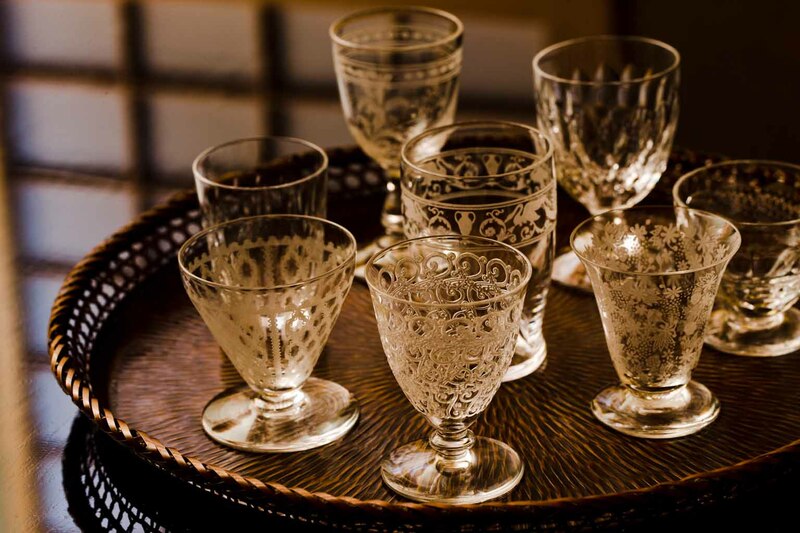 Among his collection are antique pieces like Bacarat crystal glasses and Chinese pottery, modern items, and restored lacquerware. Just like the interior, the tones are generally muted, but the pieces all have some eye-catching feature: a brush of silver or gold; incredibly detailed notched edges; or smooth sides juxtaposed with a coarse base exhibiting the sand indispensable in ceramics. These qualities reflect the character of the chef and his food as well: delicate yet deep, calm and collected, masculine with sensitivity.